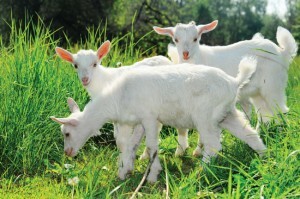 You've found the “New Jersey Saanen Goat Breeders” page here at Hobby Farm Wisdom! If this is the first time you have visited our site: Welcome! Originally from Switzerland, Saanen goats are popular for being exceptional milk producers and have a very calm, affectionate and manageable temper. They are usually white or cream colored and their milk can contain 3-4% milkfat. They are the largest of the dairy goat breeds and one of the most sought after for milk production. Does can weigh at least 135 lbs., and stand 30 inches tall. Bucks tend to weigh around 160+ lbs and stand 32 inches. They are mellow and productive and have short and fine coats with some longer fringes in the back at times. Since they are so light-colored, they can be sensitive to harsh sunlight and hot climates. Saanens have strong legs, slender faces, and medium –long ears. Many Saanen goats have beards. Can’t find the right Saanen Goat in New Jersey? Check in: Pennsylvania, New York, Maryland, Delaware, or Connecticut. Or, to see a list of ALL the Saanen Goat breeders in the US: Click Here!